Almost the majority of fishers or anglers who go for surf fishing are comfortable fishing during the daytime. Nighttime fishing isn’t as common as we believe it to be. However, it is getting more and more common as the days come. There are reasons too. Night is when the nature is silent, you are calm and to be honest with you, you are free too. Life gets a toll on us at times and for a lot of people, night is the only calm atmosphere they have in a 24 hour period. If you are someone who would like to fish during the night but is unable to decide if that’s for you, then all you need to do is read this article to see whether night fishing offers all that which you desire. 1 What Is Surf Fishing? The form of fishing that takes place on the shorelines beside any waterbody, such as sea, ocean, or lake, is known as surf-fishing. Both live baits and artificial lures can be used in surf fishing, and it mostly takes place in salt water. This sport is often regarded as a day sport, and only in rare instances do people go surf-fishing at night. However, many anglers have realized that many types of fishes, especially big fishes near shore, can be better caught at night. There are definitely some benefits of surf fishing although it isn’t that common everywhere. Let’s look at some of them. Less Competition- The number of anglers fishing at night is less compared to daytime, so there will subsequently be less competition in the shoreline and more space for anglers to fish comfortably. No Sunburn Or Skin Damage- One problem of fishing during the day is enduring sunburn, but this issue can be bypassed by surf-fishing at night. Anglers will not have to spend on sunscreens to protect themselves from harmful UV rays either. No Seasickness-Other health-related issues faced by anglers, such as seasickness, can be avoided by fishing during the night because the water tends to be calmer compared to the midday. No Exhaustion From Heat-During the scorching warmth of summer, angling on the shoreline during the day can be a drag for many. It can be very uncomfortable, and it could affect an angler’s effectiveness in catching fish. This problem can also be overcome by fishing at night when the area surrounding waterbodies are cooler. Easier To Trick Fishes At Night-One more benefit from fishing at night is related to the visibility of fishes. The hook, line or leader of the fishing rod may not be visible to the fishes at night time. So, fishes cannot differentiate fish bait from other sources of food. Feeding Habit During The Night– During the night, there is a higher chance of more fishes, particularly predator fishes, moving near to the shoreline to consume food. It is always easier to catch bigger fish during the night due to this reason that during the day. Less Crowded At Night-Anglers may find it difficult to fish during the day because water bodies may become crowded with swimmers and surfers. This problem would not occur if they chose to fish at night. Finding The Right Equipment-They can first look for the right equipment or even an entire rig. Nowadays, it has become easier to obtain rigs online on websites such as Fish Finder Rig or Drop Rig. Fish Finder rig is believed to be the best when catering to beginners. Other options can also be explored later. Locating A Target Zone-First of all, finding a good spot for fishing is crucial, and it might be difficult to do so at night. You should search the beaches or other shorelines for good spots during the day so that they can come back later in the night for fishing. Low tides can be utilized effectively to look for areas with dips, hollows, sandbanks, and structures to make a guess of where fishes might feed or hide once high tide sets in. Ask For Help From People Nearby- The locals and other bait/ tackle shop employees can give suggestions on the perfect spot to fish. If a rip or cut exists through the shoals, then anglers must fix that spot for fishing, as such spots offer higher productiveness when it comes to fishing. Keep Track Of The Tides-Anglers must also keep in mind the tide of the waterbody when attempting to fish. This can be done by means of a tide chart. Fishing during high tide can be more effective than fishing during low tide because it can draw big fishes closer to the shoreline. However, anglers must avoid fishing during slack tide when fishes have pulled away from the shoreline the most. Therefore, it will be counter-intuitive for them to fish during slack tide. Instead, they should try to fish before or after a few hours from the slack tide, to raise productivity and effectiveness. It is much better for anglers to arrive and start fishing two hours before high tide, and then keep fishing for four consecutive hours. Stay Updated About The Weather-Weather forecasts can also be quite helpful to keep track of atmospheric conditions such as wind speed, tide speed, and so on. 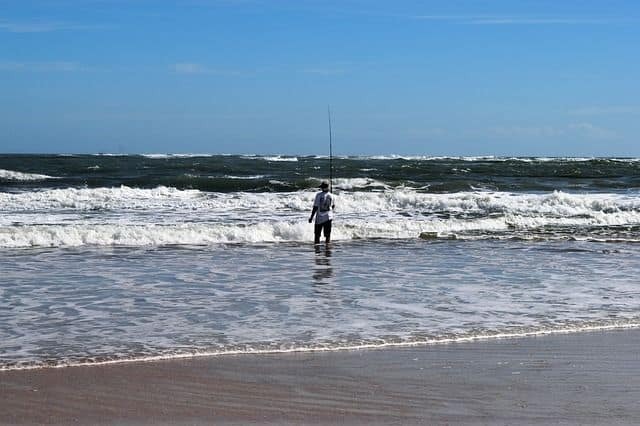 It is difficult to fish successfully if there are high winds and rough surf, or if it is raining. Setting Your Rig Right-Organizing one’s fishing rig is just as important as fishing itself. Successful fishing depends on the availability of proper angling equipment, so anglers must be well prepared before going off to fish during the night. Moreover, visibility is a problem for every angler during the night; therefore, they must properly organize their equipment so that they can be accessed easily. Hooks, sinkers and leader materials can be reached much more easily if the entire rig is organized properly. Don’t Forget To Carry Essentials– Another thing that everyone must carry to cope with visibility issues, associated with fishing at night, is a good flashlight or headlamps. A headlamp is even better than a flashlight because it allows anglers to work hands-free which is necessary to catch fishes successfully. Apart from that, shorelines can be infested with different forms of insects and bugs during the night, so anglers must carry a bug spray to avoid having a tough time fishing. Also, keeping a handy notepad to make a list of fishing equipment and other necessary items can help anglers from forgetting anything useful. Know Your Bait-Surf fishers must also carry the appropriate live bait with them before setting off for fishing during the night, and this might vary depending on situations. Mole crabs, squids, sandworms, ragworms, bloodworms, shrimps, mullet and both hard and soft shell crabs are believed to be effective live baits. If you aren’t completely sure, simply asking around in bait shops can also help reveal secrets on the best live baits that can be used based on the area or type of fish expected to be caught. Take Adequate Safety Precaution-Waves and undertows can also cause pose risks for fishermen during surf fishing, as they can cause injury or even death in extreme cases. If they choose to utilize waders during fishing at night, they must wear a wader belt to prevent water from entering waders even if they fall into the water accidentally. Enjoy Fishing With Some Company-Having a company is also important, to have an extra hand to help out setting up the rig. Taking a friend or family member can help raise the probability of catching larger fishes. There isn’t too much of a difference, in terms of technique, between surf fishing during the day and during the night. The only issue at night is visibility. However, there are benefits associated with fishing at night as well, such as being able to avoid the hot sun and the shorelines are also less crowded. Different Rods Give You More Options-Every angler must keep different surf rods with them when setting off for surf fishing during the night. Different rods can be set up with different rigs and different baits, to be able to catch a wider variety of fishes. Therefore, it diversifies the options available to anglers. Rods With Spinning Reels Are Better Than Normal Rods- Surf rods with spinning reels and bait runners are much more preferable to generic surf rods. The bait runner surf reel is particularly useful in the sense that it prevents from big fishes from yanking the entire set up of anglers out into the surf. Moreover, dual drag systems present on some surfing rods can help anglers from losing expensive rods and reels to the water bodies. Know The Difference Between Surf Fishing And Other Kinds Of Fishing-One of the fishing techniques that makes surf fishing different from the pier or shore fishing is surf casting. The fishing rods used in surf fishing are longer and sit between 12 inches to 16 inches. So, anglers must carry a variety of these types of surf rods to fish effectively. Surfcasting requires the anglers to use both hands, and even, their entire body to cast the rope. In this way, more distance can be covered by the surf rod even if the anglers are standing at the shorelines, and inshore fishes that are eating can be reached more easily. Maintaining Safety When Casting Rods Is A Must– Anglers must also be careful when casting their surf rods because they often have razor sharp hooks. 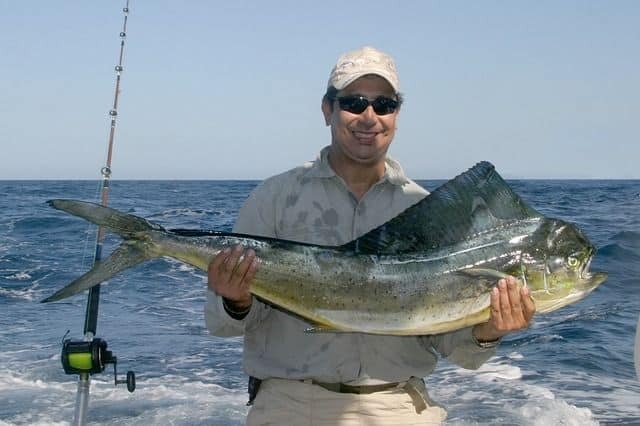 Since surf casting requires casting with more upper body power, there is a risk of injuring the surrounding people all around the angler if they are not careful. The Best Rig For Surf Fishing – if you want to get your hands upon one of the best surf fishing rigs out there, then you can take the help of fish finder rig, and then followed by the drop rig after that. If you happen to be totally new to this fishing sport, then start with the fish finder rig as it is one of the best for beginners. Once you get the hang of this, you can easily switch on to others or try some others to experiment. Get All The Relevant Information About Your Chosen Area – If you want to improve your fishing skills and achieve success, then collect all relevant information beforehand. Utilize low tides to test out your fishing area for any sort of structures, such as dips, sandbanks or hollows so you can get an idea of where it is possible for fish to hide or feed under water when the tide comes back. Furthermore, don’t shy away from the locals of an area, or employees of nearby fishing or bait shops to ask about places where you can find a lot of fish or different kinds of fish. Choose Live Bait Over Fake Ones – if you aren’t sure about what kinds of bait to use, always ask for suggestions from employees of the local fishing stores. Depending on what kind of fish you want to catch, there are a lot of live baits such as mole crabs, sandworms, bloodworms, squid, shrimp, mullet and many more. Overall, surf fishing at night is very different from any other kind of fishing which you might be familiar with. While you usually see people fishing under broad daylight, you not only need skills to adjust yourself to the low light setting but also know how to effectively fish in such a time. Besides all that, there is a whole of information that you need to know; starting from the kind of equipment to the sort of bait, to the perfect location and so much more. Hopefully, this article has successfully covered all that you needed to know and helped show what you need to start fishing. So without further ado, give surf fishing at nighttime a try!